What are the USDA Peanut Butter Color Standards? The USDA quality system assigns peanut butter quality rating of USDA Grade A, Grade B and Other based on 4 attributes that total 100 points. All four quality characteristics are based on sensory qualification but color can be quantified. 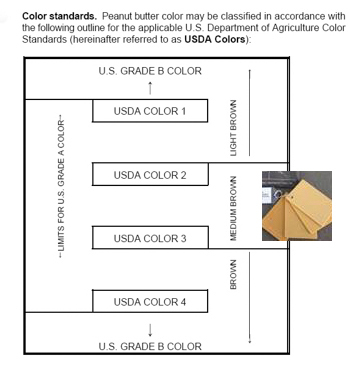 The USDA Peanut Butter Color Standards are a set of 4 plastic chips that serve as visual guides used for defining the color of processed peanut butter defining USDA Grade A (2 to 3 Medium Brown) between too light (1 Light Brown) and too dark USDA Grade B (4 Dark Brown). 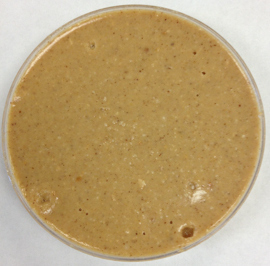 A USDA Peanut Butter Color standard is a visual guide based on plastic chips and is different in appearance from actual peanut butter. While you can measure the color of the Peanut Butter Color chips as a direct approximation, the best correlation method is have several peanut butter quality experts visually evaluate the color of the peanut butter using the USDA Peanut Butter visual guides for your product color range of interest. Then measure the color of the peanut butter using your standard method and look at the correlation of Hunter L or CIE L* (lightness) to the consensus grades of the quality group. This will give you the best correlation to these USDA Peanut Butter grades, and you should be able to report to a single decimal place if you are doing instrumental measurement. Color defects involve spatial information separate from color. Typically color defect evaluation is performed visually under uniform viewing conditions. The USDA offers a photo guide as a starting point for defect evaluation.